After all, Life IS for The Living. Didn't we just say that after when sat around and cried about Marilyn's passing down in Bryce? When we worked those 2.5 years at the Good Ol' RSVP there in Dear Ol' EICAP, Sharon was one of the Bright Lights. We sure enjoyed her Dear Friendship and we had some real Good Time Days together. I'd like to tell you about one such Good Time Day. She lived next to a used car dealership. The dealer had a Mary Kay Pink Cadillac. Sharon sweet talked the dealer out of the Pink Cadillac for a day so Houn' Dawg, Sharon and I could go up to Saint Anthony--that's where Houn' Dawg was born. We had a real Good Time Day and when we left the Senior Center there Sharon asked us to take the back road to find someplace important to her childhood. We drove all over God's Creation in that danged Pink Cadillac and never found what she was looking for. You should have seen all the old farmer folks give us "the eye" as the Pink Cadillac cruised by on deserted rural roads with Houn' Dawg at the wheel and Sharon riding shotgun. I tried to keep a low profile in the spacious back seat. Another of our many Good Time Days was when she and I toured the Rexburg LDS Temple together. Being a devout LDS member she pointed out all sorts of little things I would have never noticed except for her caring guidance. In one of the great rooms of The Temple, the Church had commissioned an artist to paint all the walls with this awesome oil paint work. Off in a corner of the painting was a young deer staring at a butterfly. I pointed it out to Sharon and sure liked that scene. I like to think that's what Sharon is doing right now--staring at butterflies in Heaven's rolling green pastures. Somehow when Sharon was growing up on a farm her Dad challenged her to try to stare down a chicken. She loved trying to stare me down but she could never do it without breaking up in hysterical laughter. That's why I nick named her Chicken Eye. She sure had one heck of a piercing eye! It was all I could do to maintain my stare until she gave up and started laughing so hard. Oh, yeah, Sharon was One Awesome Woman! Sure, she could complain about her workload with the best of them but she always put her nose to the grindstone and got her job done well, even if she didn't agree with the process or the rationale behind what she was doing. Sharon was one of those people you only meet once in a great while out on Life's Trail. We wish we could grab on to her star and share her glow for awhile. Alas, Sharon is gone and that's that. There's nothing any of us can do about it. 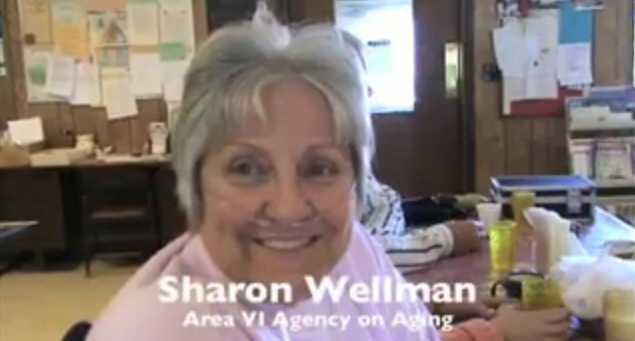 We took a screen shot of Sharon from our Chicken Fried Steak video. That's the view you see of her above. Below, you can watch the entire video. Oh, and by the way, Chicken Eye Sharon, this Chicken Fried Steak is for YOU! Enjoy!